Four North Shore artists were selected to participate in a public art display on North Michigan Avenue in Chicago June 19 through August 11. The display, “Lighthouses on the Mag Mile”, celebrates a call to action of access and inclusion for people with disabilities. This free exhibition includes 51 six-foot tall lighthouse sculptures that were created by national and local artists — disabled and able-bodied included. The artists will share their views on access and inclusion, which people can listen to on a smart phone application. The event is sponsored by The Chicago Lighthouse, a social service organization that serves the blind, visually impaired, disabled and veteran communities. 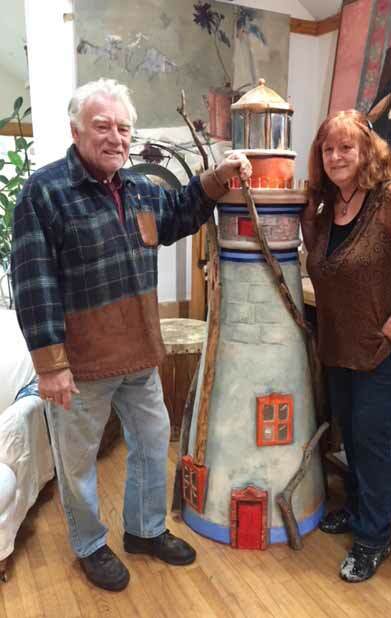 Sandie Bacon and John Hatlestad of Lake Bluff collaborated on a lighthouse sculpture for the event. “It is both an honor and humbling to be selected for a public art project, but the best part is that it provides an opportunity to communicate with a wide swath of people who otherwise might not be engaged,” Bacon told DailyNorthShore. When Bacon and Haltelstad considered how a blind person might “read” the lighthouse, they decided to focus on textures. The bottom third of their sculpture is stucco, while the top is smooth with a metallic copper dome and windows. They also included actual roots and branches, stripped of their bark, embracing the lighthouse, reaching toward the light. “Growing plants, branches and roots are symbols of accessibility (stars and the moon, trees, dogs … and an ever burning light in the windows of the dome),” Bacon said. Hillary Laff-Meyers, a painter from Deerfield, was excited to participate in the Lighthouse project. “To have my artwork in a high-visibility area is both thrilling and surreal. 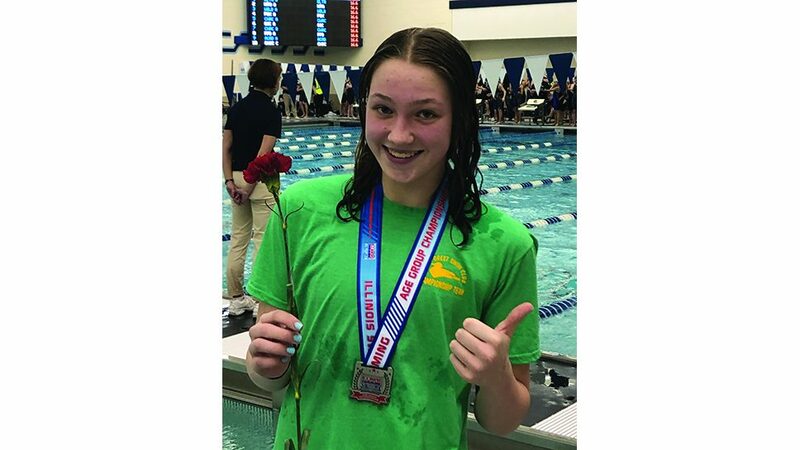 I’m so excited to share my vision with the public and at the same time I’m pinching myself,” said Laff-Meyers. Laff-Meyers also shared her own views on access and inclusion. “I will be sharing my personal message of how our layers run deep. We all have many layers to us. We can’t always help what we show the world on our outer-layer and sadly, our abilities are often judged by what people see,” she said. But Laff-Meyers also shared her optimism. “If we take the time to peel back layers and get to know each other beyond what we see, that inner-layer has so much to offer and hopefully we will be pleased with what we learn about each other,” she said. Diane Rakocy, an artist from Winnetka, was overwhelmed to participate in a public art project. “Ever since I saw those painted cows on Michigan Avenue a couple of years ago, I thought it would be so cool to be part of a public art project like that. And the fact that this year’s event is sponsored by The Chicago Lighthouse Organization is a complete win-win because they do so much good in the world and now I’m a part of that too,” said Rakocy. 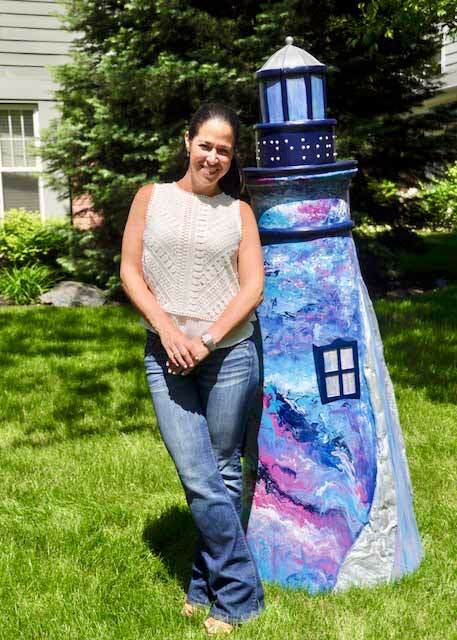 Diane Rakocy with her Lighthouse sculpture. Rakocy focused on the beauty inside of a person when she painted her lighthouse sculpture. “To me, access and inclusion is all about seeing the beauty inside a person – no matter what the circumstances are on the outside. I wanted to create a piece that was both representative of that concept and of the way I paint,” she said. 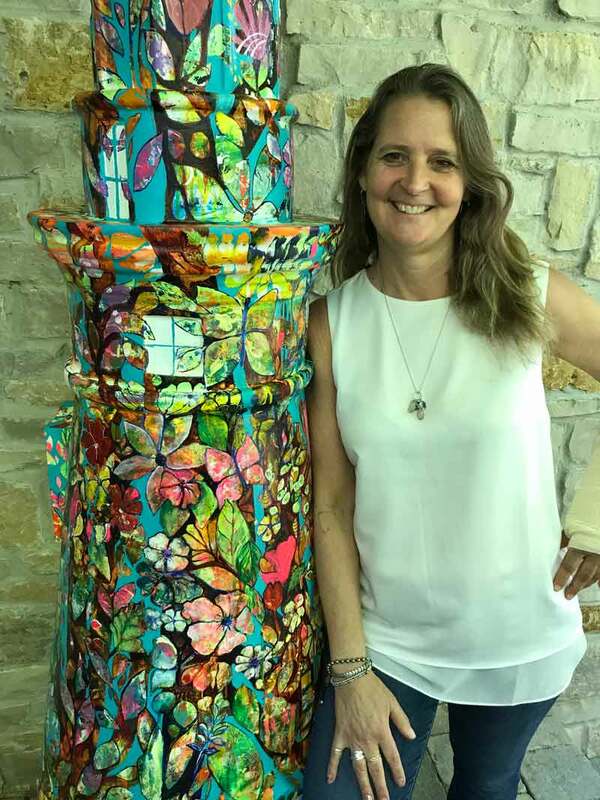 The Lighthouse project is the first time the studio Arts of Life in Glenview participated in a large-scale public arts project. 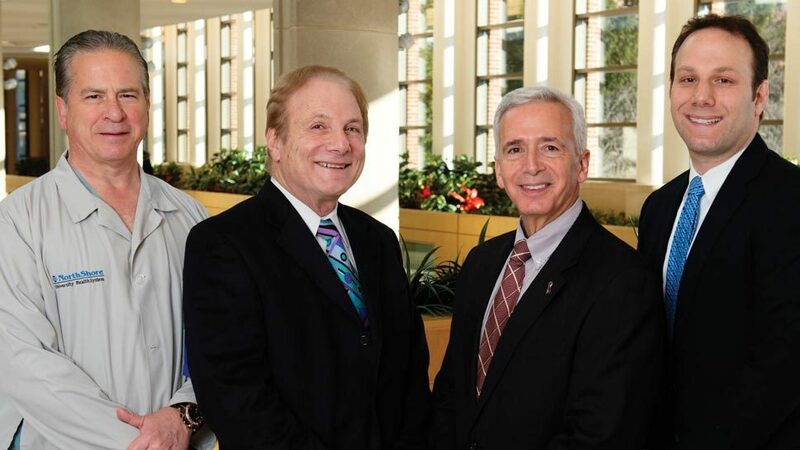 Arts of Life is a nonprofit organization that advances the creative arts community by providing artists with intellectual and developmental disabilities a collective space. 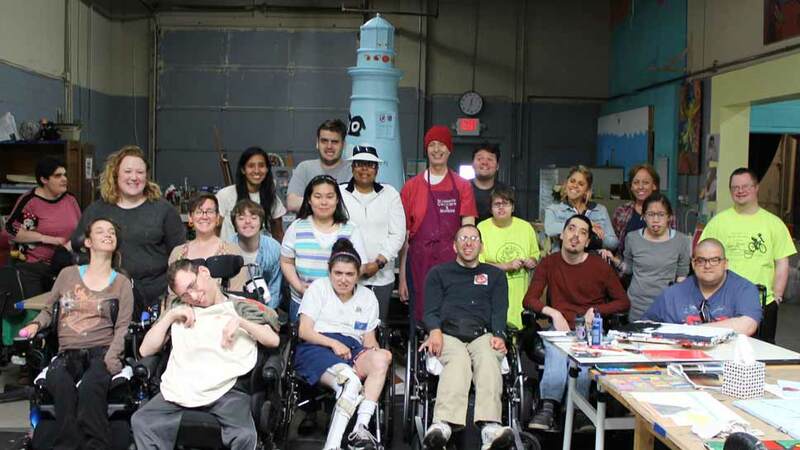 The studio’s lighthouse entitled “Eyes” was a collaborative project painted by more than 30 community members and artists with and without disabilities. It’s comprised of 200 unique sets of painted eyes of all shapes, sizes and colors with acrylic paint. “The eyes represent the unique ways our community sees and creates as individuals while working toward a collective goal for visibility and independence,” Vincent Uribe, art director at Arts of Life, told DailyNorthShore. For more information about the “Lighthouses on the Mag Mile go to www.chicagolighthouse.org.